Part of the pre-1900 map of Bottesford parish showing the junction at the West End of the village and the possible location of the Cox's home in 1911. 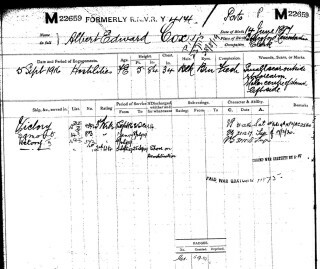 The single service record for Albert Edward Cox. Albert E Cox was included in the list of Absentee Voters in Bottesford, 1918/19. His address was given as the West End, and at the time of compiling the list he was serving on HMS Egmont. Albert Cox was born on 14 June, 1897, in Bottesford, son of Henry and Mary Ann Cox. Henry Cox was born in 1858, in Hitchin, Hertfordshire. Mary Ann Cox was born in 1857, in Nottingham. There were 5 sons and 1 daughter in the Cox family – Harry (born in 1881), Sidney (b.1883), Clifford (b.1885), Walter (b.1892), Albert (b.1897) and Lilian (b.1894). 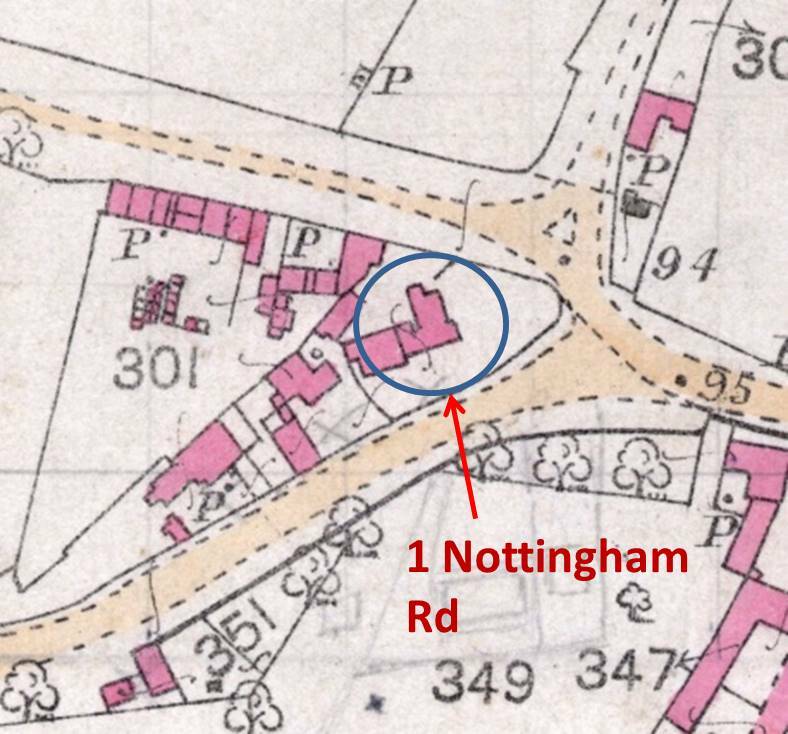 In 1891, the Cox family lived in the New Railway cottages, by the railway bridge on Nottingham Road. Henry Cox was a railway signalman born in 1858 at Hitchin, Hertfordshire, and his wife Mary Ann was born in 1857 at Nottingham. With them were three sons, Harry (b.1881), Sidney and Clifford. In 1901, the family lived on the High Street, Bottesford. The house was located on the northern side of High Street, at its western end, set back from the main road, on the corner of High Street and The Nook (Pinfold Lane). The children were Sidney (working as a commercial clerk), Clifford (also a clerk), Walter, Lilian and Albert. 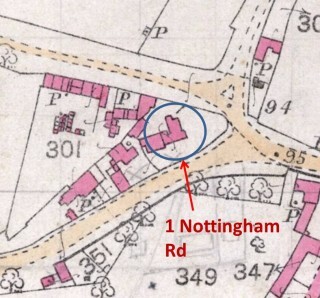 In 1911, their address was recorded as 1, Elton Road (Nottingham Road). With Henry and Mary were Walter (a teacher), Lilian (a milliner), and schoolboy Albert. Albert was the third of the sons to Join the armed forces. Clifford, Walter and Albert Cox are all in the Bottesford ‘church organ’ list of WW1 service men. Clifford Cox served in the Royal Navy from 1904 until 1916, then again until 1923, and added a further spell in 1926. Like Albert, he was a clerk (a Writer) in the naval Shore Establishment. Walter Cox first enlisted in 1911, as a reservist with the Lincolnshire and Leicestershire Army Service Corps, and then joined the 5th Battalion, Leicestershire Regiment in 1915, serving in France until he left the army in February 1916, as Staff Sergeant Cox, on “Termination of Engagement”. Walter Cox went on to become headmaster of Bottesford School and then re-enlisted in WW2, reaching the rank of major. A single sheet of his service record is available online from the National Archive, and this may well be all that has survived. However, this provides a summary of his military service. 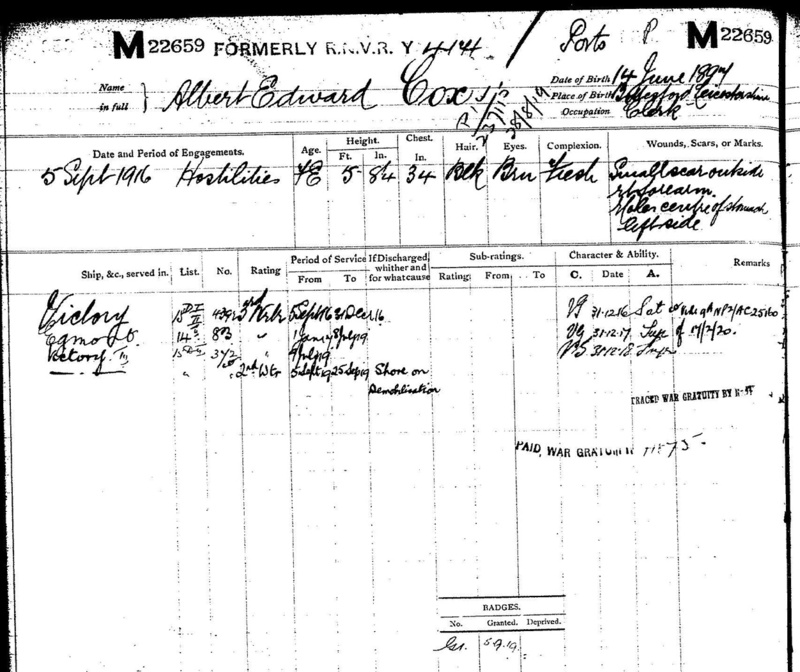 Albert Edward Cox joined the Royal Navy, service number M22659. He enlisted before 5th September, 1916. His civilian occupation was recorded as a clerk, and during his military service he was referred to as a ‘writer’. H.M.S. Egmont was an armoured frigate of the 19th Century, but during WW1 this old vessel was used as a depot ship moored at Chatham (Wikipedia). Albert E Cox was demobilized after 25th September, 1919, and was awarded the British Medal (presumably this refers to the British War Medal). Note: we are unable to enter his rank and unit correctly at present - HMS Victory etc. were shore establishments of the Royal Navy. His rank is uncertain, but certainly was not an army rank. Please bear with us on this points. We have at present no information about Mr Cox's life after demobilsation, but hope to add something in due course.